Ownership / Access: Duke of Northumberland. 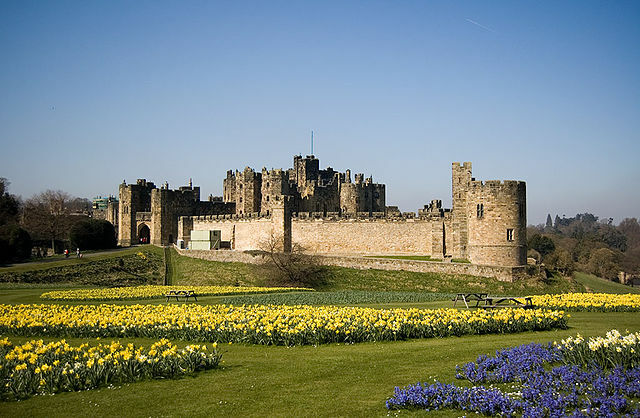 Notes: Alnwick Castle is a castle and stately home in the town of Alnwick in the English county of Northumberland. It is the seat of the Duke of Northumberland, built following the Norman conquest, and renovated and remodelled a number of times. It is a Grade I listed building and as of 2012 received over 800,000 visitors per year. Adjacent to the castle, Jane Percy, Duchess of Northumberland, has initiated the establishment of The Alnwick Garden, a formal garden set around a cascading fountain. It cost 42 million (press release of 7 August 2003). The garden belongs to a charitable trust which is separate from the Northumberland Estates, but the Duke of Northumberland donated the 42 acre (17 ha) site and 9 million. The garden is designed by Jacques Wirtz and Peter Wirtz of Wirtz International based in Schoten, Belgium. The first phase of development, opened in October 2001, involved the creation of the fountain and initial planting of the gardens. In 2004 a large 6,000 sq ft (560 m2) 'tree house' complex, including a cafe, was opened. It is deemed one of the largest tree houses in the world. In February 2005, a poison garden, growing plants such as cannabis and opium poppy, was added. May 2006 saw the opening of a pavilion and visitor centre designed by Sir Michael Hopkins and Buro Happold which can hold up to 1,000 people. As of 2011, there are still several areas to be completed, in order to fulfil the original design.